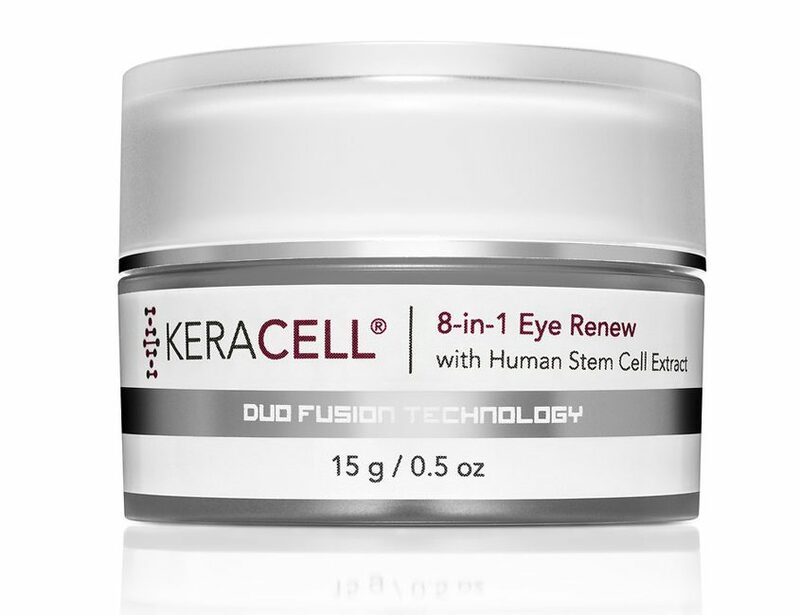 KERACELL® 8-in-1 Eye Renew with MHCsc technology is the ultimate eye restoration treatment to help minimize fine lines and wrinkles, reduce under-eye and eyelid puffiness and minimize dark circles. This dense cream fights the signs of aging with targeted peptides, botanical extracts of cucumber and licorice root to help firm, lift, brighten and smooth the eye area. Soft focus and line blurring agents provide an immediate effect and Argireline helps relax muscle contractions that lead to permanent wrinkles. Deionized Water, Aloe Barbadensis (Aloe Vera) Leaf Extract (Organic), Acetyl Hexapeptide-3, Cetearyl Alcohol, Cetearyl Olivate (and) Sorbitan Olivate, Polysilicone-11 (and) Water (and) Laureth-12, Glycerin, Cera Alba (Beeswax), Cetyl Palmitate (and) Sorbitan Palmitate (and) Sorbitan Olivate, Glycerin (and) Water (and) Dextran (and) Trifluoroacetyl Tripeptide-2, Dextran (and) Caprooyl-Tetrapeptide-3 (and), Capric/ Caprylic Triglycerides, Montmorillonite, Cucumis Sativus (Cucumber) Fruit Extract, Hydrolyzed Rice Protein (and) Water (and) Prunus Amgdalus Dulcis (Sweet Almond) Seed Extract, Butyrospermum Parkii (Shea) Butter, Glycyrrhiza Glabra (Licorice) Root Extract, Panthenol, Palmitoyl Tripeptide-5 (and) Panthenol (and) Sodium Hyaluronate, Conditioned Stem Cell Media, Xanthan Gum, Phenoxyethanol (and) Ethylhexylglycerin. Apply cream completely around the eye area and gently pat in until absorbed.